Of course, you won't simply be allowed to wander into the dark and get away Scot free, there are barrier, traps, events and of course beasties to be overcome. All of these involve choosing skills, activating abilities and rolling dice in an attempt to pass the required test and this is where Legends Untold reveals its greatest strength and biggest weakness. Here's the thing, Legends Untold is complicated. There are numerous skills, abilities and modifiers. There are masteries to remember, light and alertness levels to track, combat ranking and advantage and disadvantage statuses to consider. The good thing is that this adds considerable depth to the experience, every fight, every skill test, every trap becomes a careful consideration of each characters' skills, health levels and the distance to the next campfire, treading that line between careful planning and pushing your luck. The problem is that keeping track of all these factors is a complete nightmare (or should that be Knightmare - ooh nasty). There are a lexicon of symbols and status effects that take up more space than the game itself and there are tables in the rulebook that need to be referenced too much. If you go back to our UK Games Expo podcast you'll hear me describing the game as 'busy' and although efforts have been made to streamline Legends Untold, it's still a lot more complicated than most modern board games. But I'm beginning to feel that if you strip out too much of this complexity it will lose its sense of identity. 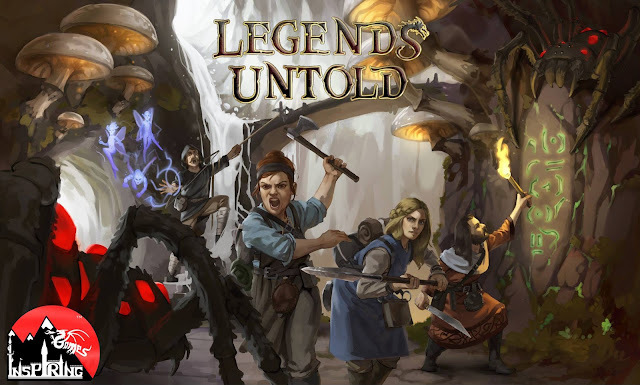 Legends Untold is attempting to bridge that gap between classic role playing game and the modern board game dungeon crawler by adding that depth of characterisation not seen in this kind of game. It means that the game has a pretty steep learning curve, and, what seems to be the scourge of every Kickstarter, a rulebook that needs some improvement. The game is hearkening back to a bygone age, taking its influence from such diverse sources as Fighting Fantasy books and the ropey 80's TV show Knightmare (not to be confused with the equally ropey VHS board game, which over here had to be renamed to Atmosphere to avoid confusion with the aforementioned TV show). This combination of design concepts and influences creates a very British game. It's difficult to pinpoint a cultural identity on a board game but if you'd wrapped up Legends Untold with some 2000AD art you'd be having a full on early Games Workshop nostalgia trip. I haven't even got to the best part of Legends Untold, exploration. It's the game's unique selling point making it both a genuine exploration and every game different. As you play Legends Untold the dungeon is created randomly through the use of exploration cards. As you press on into the dark you will add cards to the map creating a sprawling mass of caves, cellars and the sewers. As long as you keep pushing forward (which in most scenarios you have to do) it creates a maze of tunnels and traps as you travel further and further from the surface. Occasionally you will have to travel back, usually due to a barrier your party doesn't have the skills to bypass or a monster that is going to chew you up and spit you out in your current state. This doubling back is another feather in Legends Untold's pointed wizard's hat, allowing you to choose your path and ensure you are not beholden to the randomness of the encounter decks, but it does mean that sometimes the dungeon won't create a logical map. There will come a point that you just can't marry up two dungeon tiles and there's nothing in the current rules to overcome this issue. Personally, we took a little artistic licence, played the cards over a blank piece of paper and drew long and winding tunnels. Normally this is where I would come down harder on a game than a stage diving ogre but I'm willing to overlook quite a lot of Legends Untold's foibles, because, well it's so darn charming. I'm reminded of Xia Legends of a Drift System, a game that quite frankly has some horribly outdated and awful mechanics (roll and bloody move?!) but at the same time I absolutely love the game both as healthy dose of game nostalgia and because it's just too much fun, and Legends Untold makes a very good parallel to Xia. Both are far more complicated than a modern board game should be and both have a design ethos firmly rooted in the past but have somehow managed to create modern game that is compelling to play. That said it certainly isn't for everyone. Andy left our game with a lack of interest verging on terminal apathy. To be fair he had some solid reasons for not liking the game, citing the disparity between the perceived simplicity and the actual complexity. However, I think his biggest gripe was lack of narrative drive. Legends Untold is a random game, the scenario creates the purpose and the win conditions but the rest of the game is completely random, having a dungeon created on the fly makes each exploration unique but means that the story and the experience rarely marry up, a problem I encountered at the UK Games Expo where I found the quest item in the first room of the dungeon, a bit like keeping the Holy Grain in the umbrella stand. I am writing this review before the Kickstarter project goes live, so I am unaware what is going to be packaged in each box. I was simply provided with cards and had to supply my own dice, thankfully being a lifelong geek I have enough dice stowed away to melt down and make a life size statue of Gary Gygax. However, I also thought I needed to supplement the game further with tokens, player markers and counters. Again, my box of nerdy Hardware came to its aid but I feel this game would benefit from some tokens that I don’t think the initial Kickstarter budget is going to be able to cover. I'll be honest with you; I am struggling with Legends Untold. It makes an interesting comparison to the Warhammer and Pathfinder adventure card games, two games that take a very similar concept but make much slicker, more highly polished approaches to the game. However, both of the adventure card games have had to employ a high level of abstraction to achieve that sheen, sacrificing theme. Legends Untold is an actual dungeon that plays out in front of you and takes no more than an hour to explore and conquer but by trying to make a game that's as deep as a role-playing game means it can often end up being a bumpy ride. So, here's my dilemma, Legends Untold is more complicated and more random than a lot of modern board gamed and yet I can't help playing it. There is something about the game’s charm that I can't escape. Just like retro video games that use pixel art or recreate old-school PRGs, Legends Untold has one foot in the past but the other firmly stepping forward into the modern day creating a quick dungeon crawler with depth. The ultimate question becomes, am I going to back this Kickstarter? And the answer is yes, yes I am.